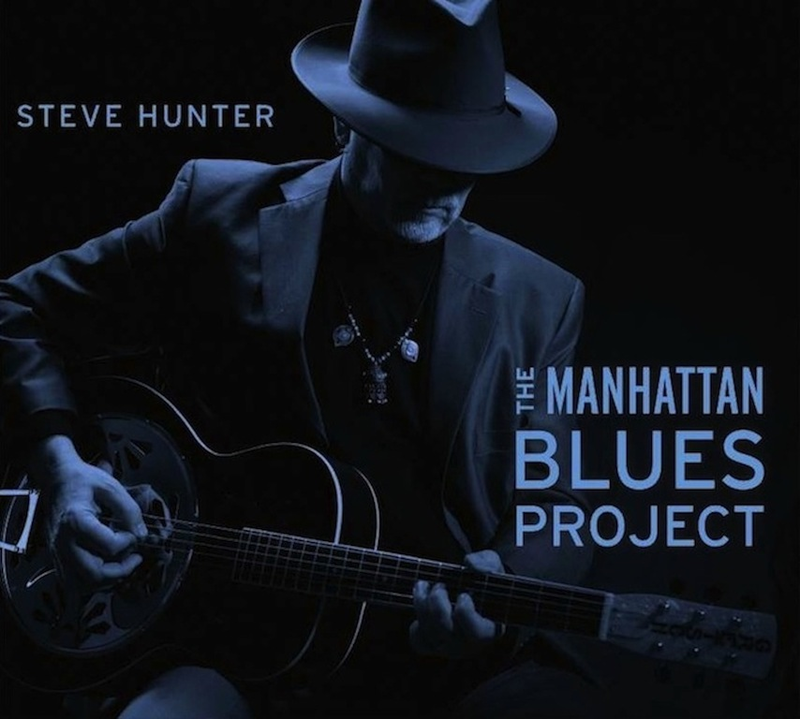 Phoenix, AZ – Guitar legend Steve Hunter, best known for his work with Alice Cooper, Lou Reed, Peter Gabriel, David Lee Roth, Jack Bruce and Aerosmith, has a new CD released, ‘The Manhattan Blues Project’, featuring an all-star guest line-up! This is Steve’s fifth solo album and is a culmination of his love of the Blues and New York City mixed with his love of melody and “Tone Poems”. After recording and touring with Alice Cooper in 2011, he decided to get off the road to write and record. He thought it would be cool to have some guest players join him and was overjoyed and humbled at the willingness of those he asked to contribute to this project. Many of the guests he had not worked with before and most had a very different style of playing to himself. There are two cover tunes but this album is mainly new material written, played and produced by Steve. He was very happy to also include a short composition by his friend Jason Becker, called “Daydream By The Hudson”. On ‘The Manhattan Blues Project’ Steve goes back to his blues roots in his own unique way. You will hear string arrangements, vocal arrangements, a burst of guitar shredding by the best in the world and echoes of The Beatles. The two cover tunes include Steve’s instrumental version of Peter Gabriel’s “Solsbury Hill”, a song he had played the guitars on for the original album version in 1977. The second cover is from one of his favorite artists Marvin Gaye, “What’s Going On”. The Manhattan Blues Project is a rich, uplifting musical experience with lashings of soul, passion and outstanding performances from everybody involved! This entry was posted on Wednesday, July 3rd, 2013 at 01:23	and posted in Press Release, Steve Hunter. You can follow any responses to this entry through the RSS 2.0 feed.